When it comes to horseback riding on Amelia Island, Kelly Seahorse Ranch stands alone. Located inside Amelia Island State Park, the Kelly Seahorse Ranch is the only ranch that receives state endorsements. Because the ranch is located in the State Park, it is nestled within the pristine Florida wilderness just off of A1A. Kelly Seahorse Ranch prides itself on being the only “ranch to beach” horseback riding service on Amelia Island. This means that, unlike other ranches, riders ride directly from the dirt paths of the ranch to the sandy shoreline. Kristin, head wrangler at Kelly Seahorse Ranch, talked about the added benefit to the ranch to beach location. The ride is 5-miles long and takes riders right on the edge of the water with sand beneath the horse’s hooves. First-time rider? No need to worry, because Kelly Seahorse Ranch wranglers go through detailed instructions before the ride begins. Kristin also mentioned the pace of the ride. And riders can’t get enough of the State Park. Weather permitting, Kelly Seahorse Ranch has four rides per day and 20 horses at the ranch. As an added bonus, Kelly Seahorse Ranch takes photos of the rides for a lasting memory. Travel through the natural habitats of Amelia Island the way the earliest settlers did at Kelly Seahorse Ranch. 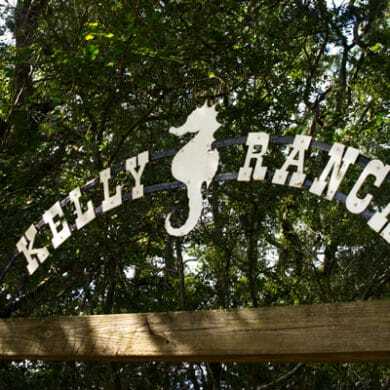 Kelly Seahorse Ranch is located at 9500 1st Coast Hwy, Fernandina Beach, FL 32034. For more information, visit the Kelly Seahorse Ranch website or call (904) 491-5166.